gomdorri (eCard Portfolio) Absolute Power Corrupts Absolutely"
^ Here is the quote. It's a famous quote that I memorized after reading Animal Farm. 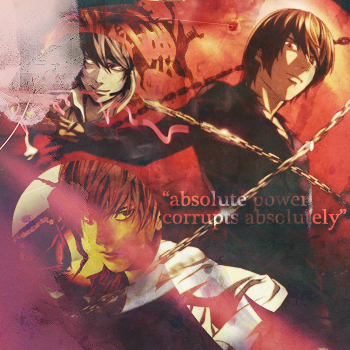 I think it really fits the occasion since, well, Light started killing tons of people after he got the power to. CORRUPTION. Pictures from minitokyo, textures from shizoo, font from dafont.